See also "Church Musicals and Collections"
A new musical for schools. 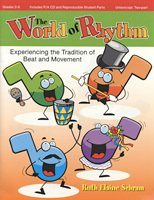 Teaches musical and performance skills while telling the story of the communications revolution! Quality repertoire included in this collection will nurture your emerging male chorus. This TB choral collection is comprised of nine titles from top-level writers Ruth Elaine Schram, Andre Thomas, Victor Johnson, Mary Lynn Lightfoot, Becki Slagle Mayo, Greg Gilpin, and Brad Printz. 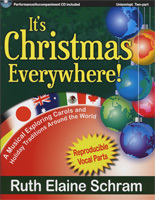 The Book / CD combination includes reproducible choral parts and an Accompaniment CD. Here is the fifth volume in a series of solo songs for young singers from BriLee Music. It contains a wide variety of songs, from spirituals and folksongs to originally composed works. 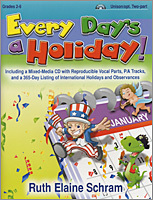 Selected with the treble voice in mind, songs with narrow ranges of six and seven notes progress to songs that expand the range as the voice develops. The nature of the selections is to challenge the voice, not to tax it; to develop its expressive capabilities, not to overextend them. 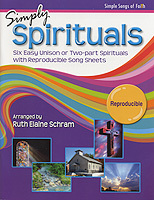 Songs by Ruth Elaine Schram include: "The Song that Nature Sings" and "Oh Shenandoah." The book/CD combination includes beautifully recorded demos as well as the accompaniment tracks. 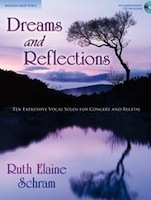 This outstanding collection features ten classic songs for any combination of two voices and piano. Alfred Music's top masterwork arrangers provide supportive accompaniments, well-crafted vocal lines, and historically informed editorial markings plus IPA pronunciation guides and complete translations for every piece in a foreign language. Superb recital, concert, and contest repertoire for developing singers! Arrangers include Ruth Elaine Schram, Patrick Liebergen, Earlene Rentz, and Russell Robinson. Titles include: Abendlied (Mendelssohn); Alleluia (Mozart); Ave Maria (Bach/Gounod); Ave Verum Corpus (Mozart); Bon Dì (Lully); Caro Mio Ben (Giordani); Kyrie (Dvorak); The Maiden (Dvorak); Pie Jesu (Faure); Where'er You Walk (Handel).